With 2016 now in your rearview mirror, you’re probably reflecting on where you’ve been and where you’d like to be, professionally speaking. For many of us, a big part of that process is reviewing — and updating — our LinkedIn profiles. There is a myriad of articles about optimizing and enhancing your profile, from making your headline non-generic to adding keywords to crafting a killer summary. This is not one of those articles. At least, not directly. Instead, I’d like you to consider your skills section. Have you looked at it lately? Which skills have the most endorsements? The least? Find any surprises there? My top skill? Public Relations. Have I ever worked in a PR firm? No. Held a title like Vice President, Communications? Nope. So why does my network believe so adamantly in my Public Relations aptitude? Your endorsed skills are a quick way for someone to assess what sets you apart, and what others view as your strengths. Said another way, they make up your personal brand. When I worked as a branding consultant at Landor, we liked to say, “A brand is a promise.” Though we were speaking about consumer and corporate brands, the same holds true for individuals: What does your personal brand promise? When someone endorses you, they’re saying that they believe that you possess that skill — and will deliver on your brand promise. Is the answer yes? Then perhaps you need to demonstrate that skill or replace it with a new one that defines your offering better. As for my top skill of Public Relations? In a way, I guess I shouldn’t be surprised. The thing I most enjoy doing — helping transform my clients in transition — calls on the very things that form the basis of public relations: writing, strategic communications, and building meaningful relationships. Listen, I’m no Cheryl Snapp Connor, but I have to trust my connections when they see — and endorse — my brand’s value. And it’s up to me to deliver on that promise. 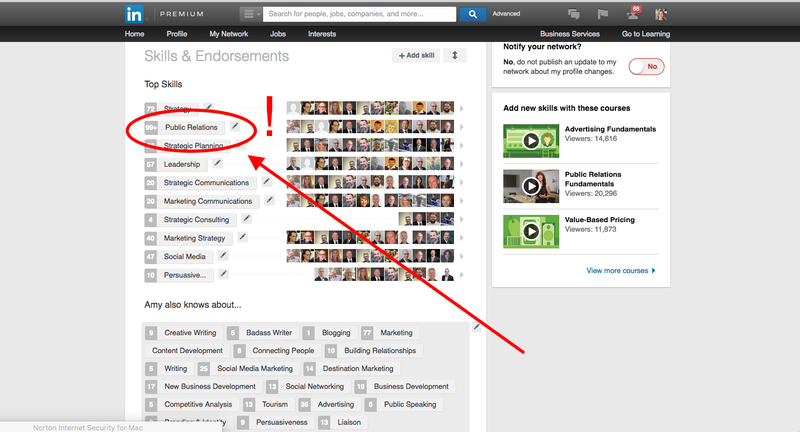 So as you review your LinkedIn profile, don’t ignore what your network is telling you. The success of your brand may depend on it. Amy is the president of rbp consulting, a consultancy specializing in helping transform organizations in transition. (Oh, and apparently she’s AWESOME at Public Relations, too — at least according to her network). Need some help? Contact Amy at rbpconsulting.org or say hi on Twitter @amyblaschka.